of Barbara’s book for audiobook narrators. If you’d like to learn about audio book narrating from the performer’s perspective, this is the book for you. The woman who has been called “the Meryl Streep of audiobooks” answers 39 questions from other voice artists and actors. Please don’t buy this book if you’re looking for an encyclopedic overview of the entire audiobook industry…or for technical advice regarding recording equipment or editing software. 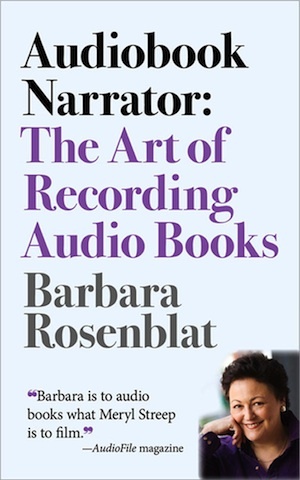 Do purchase this book if you want an intimate, insider’s look at how the industry’s most acclaimed narrator approaches her craft…along with tips for anyone who records audio books. Here Are the 39 Questions Barbara Answers in This Book. Is It Realistic for a Beginner to Expect to Break into Audiobook Narration? How Did You Begin Your Audiobook Career? How Does an Audiobook Narrator Get Paid for Her/His Time? How Do I Get Started as an Audiobook Narrator? What Specific Skills Must I Have to Voice Children’s Books? When Voicing Children’s Books, Do You Read Differently to Girls than to Boys? What Is the First Step a Performer Should Take toward Launching an Audiobook Career? Must You Be a Fan of a Particular Genre to Enjoy Narrating It? Do Audiobook Narrators Work at a Publisher’s Recording Studio or from Home Studios? How Much of the Work You Do Is Self-Directed from Your Home Studio? When You Record an Audiobook at a Studio, Do They Direct You? What Is the Timetable for Voicing a Book? All in One Day? Several Days? Weeks? Changes in Pitch or Inflection? How Do You Remember Your Voice Characterizations for Each Character? Book in a Single Take? Do You Record Sitting Down or Standing Up? How Do You Prevent Vocal Fatigue During Long Recording Sessions? How Do You Record an Audiobook When You Have a Cold? I’ve Been Told the Proper Way to Interpret Audiobooks Is to Refrain from Inflection. How Long Should an Audiobook Demo Be? In What Form Should I Submit My Audiobook Demo to a Producer or an Agent? What Should I Put on My Audiobook Demo? Should I Include Music or Other Additional Production on My Audiobook Demo? To Whom Should I Send My Audiobook Demo? How Much Money Can I Expect to Make Recording Audiobooks? Such as Self-Help, Humor or Other Nonfiction Audiobooks? Do Authors You’ve Never Worked with Ever Ask You to Record Their Books? What Does It Take to Consistently Get Work Voicing Audiobooks? What’s the Best Track for Reaching the Point of Voicing the Top Books? Are New to the Field? Is It Necessary to Live Near the Primary Locations Where Audiobooks Are Recorded? Who Most Commonly Hires the Talent? Why Do So Many Voice Actors Want to Record Audiobooks?